Since God clearly told us in Scripture that he created the sun on that particular day, we know how old it is. The assumed uniformitarian age is based on man’s belief, which excludes a supernatural creation. Therefore the billions of years are not by some direct measurement but by imposition of a belief system. The same goes for all stars and galaxies as well. But there are processes in the cosmos which result from observed causes. 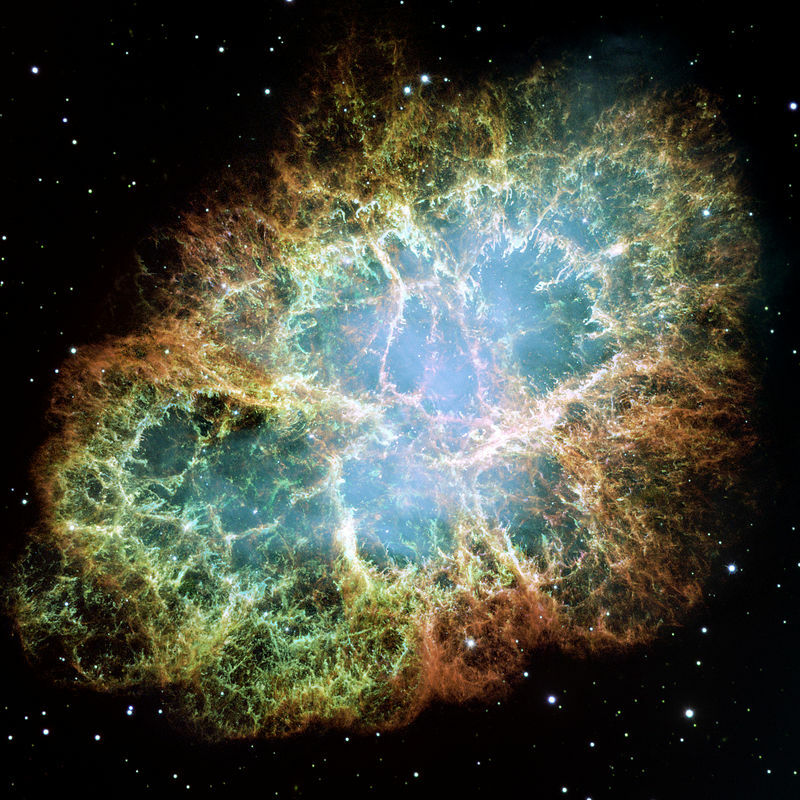 For example the Crab nebula resulted from an exploding star. History notes that Chinese astronomers in 1054 A.D. observed the explosion. John Bevis, an English doctor, is credited with its discovery in 1731. The nebula is formed by an expanding shell of gas and dust, debris blown out by an expanding shock wave. Over time the rate of expansion of the shell can be measured from Earth. Using that rate and knowing the size of the shell one can put an upper limit on the age of the structure. Usually also a neutron star is formed at the centre from the progenitor star. That is evidence that a star did indeed explode. If one then discovered such a structure that was 1 million years old, and it had an identifiable neutron star at its centre then that would disprove this ASC creationist model, wouldn’t it? Yes, it would. Now there is still a problem of the age of these structures, which I address below, but we are talking about a real universe here that is not deceptive. So you could not answer that criticism by saying that God created the cosmos ‘mature’ in the sense there were apparently million-year-old SNRs peppered around out there. That is to say, that those SNRs never came from any real supernovae but were just created in place. It is akin to God creating fossils in place in the sedimentary rocks, fossils that never represented real creatures. It would be deceptive and God is not deceptive. Though I have previously written on this let’s consider, for example, the SNR in Cassiopeia-A. See Fig. 2. I believe this is the youngest known supernova remnant in the Galaxy, located about 11,000 light years from Earth. The remnant is about 300 years old, as determined by calculation based on its observed angular expansion rate. That means the light from the explosion first was observed 300 years ago. The structure is about 10 light years in diameter. If you look near the center you can just see a small green point of light, that is the remains of a star that exploded creating this beautiful image. That original star is believed to have been about 20 solar masses (to have a mass 20 times that of our sun). The remains, which we see, is believed to be a very rare and mysterious category of a neutron star called a Magnetar. The distance then from the central progenitor to the edge of the cloud is about 5 light-years. Depending on how fast the expanding shock wave pushed the gas and dust outwards gives you an estimate of a ‘process age’. For this case, with a uniformitarian assumption of an average speed of expansion, so that the cloud expands 5 light-years in 300 years, it means an expansion rate of 1.7% of the speed of light, c. That is not unreasonable estimate, which is about 5100 km/s average speed over the lifetime of the cloud. But remember its age was determined by measuring this expansion rate and extrapolating backwards in time. So this is about as close to a direct observation you will get and so soon after it exploded. The data hence should be reliable. In this case we would say the ‘process age’ of the cloud is 300 years. That means from the time the star was observed to have exploded (or could have been observed) until now is 300 years. Astronomers would simply say it is the age of the SNR. Such structures as this one fit easily into the Lisle ASC model described in the above mentioned paper. But what about one of the ‘oldest’ SNR in the Galaxy, GSH 138-01-94, found in the outermost regions of the Galactic disk? See Fig. 3. So we’ll compare the ‘youngest’ to the ‘oldest’. This SNR is claimed to be 3 million years old based on the expanding cloud.1 The solid circle indicates the position now of the SNR shell. The arrow indicates the source of the material, the central progenitor’s location, from which the material has expanded. Table 1 is reproduced from Stil and Irwin (2001)2 indicating that the SNR is 16.6 kpc (or 54,000 light-years) distant from Earth. It has a mass of 200,000 solar masses, a radius of 180 pc (or 587 light-years). 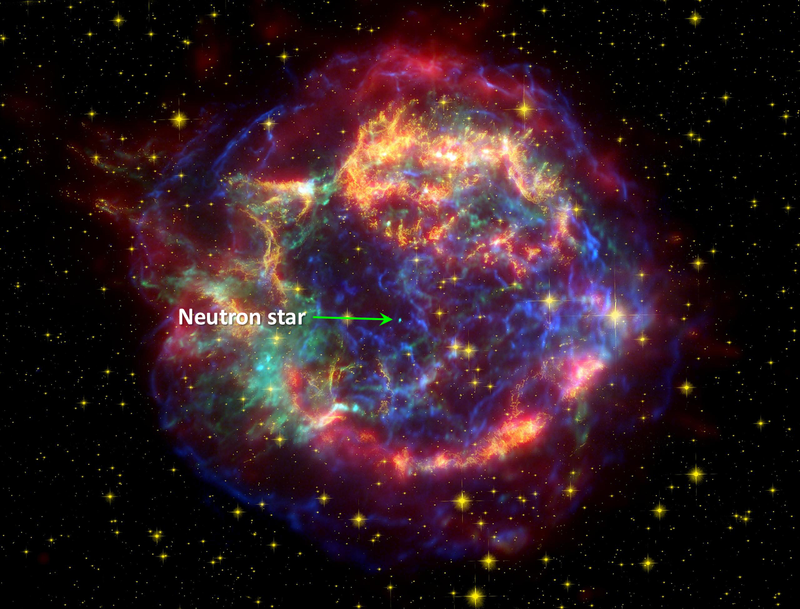 When this paper was published in 2001 the SNR was claimed to be the largest and the oldest supernova remnant known. In that paper its age was estimated to be 4.3 million years based on the expansion rate of the shock wave and simulations of the expanding cloud. In 2008 Kobayashi et al.1 estimated its age to be 3.0 million years. This is the alleged process age for the SNR. How can a 3-million-year-old structure be accommodated into a cosmology that requires all such process ages to be less than about 6,000 years? That is what is required in the creationist ASC model I have used. From Table 1 the measured expansion rate of the SNR shell is now (i.e. when observed) about 11.8 km/s. That is much lower than the average I estimated for the Cassiopeia-A SNR shown in Fig. 2. About 500 times lower, in fact. 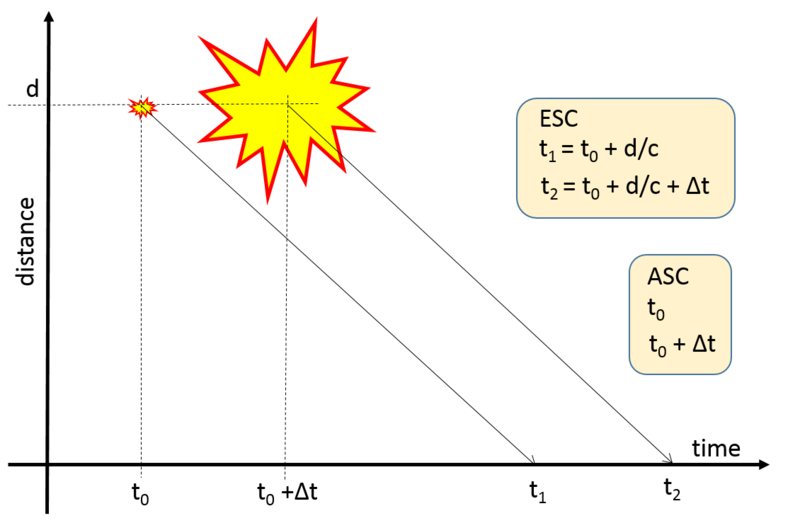 The kinetic energy of the expansion of the larger SNR shell (Fig. 3) was much more than the former, but the mass is 10,000 times larger in the latter. The ages of these structures are highly dependent on the modelling used. The modelling is necessary because only the currently observed expansion rates are available. The unobserved rates back in time closer to the initial explosion are not available to us today. But one can expect a much higher rate initially than later. So the age measure of these SNR is totally dependent on uniformitarian assumptions, just like with any age determination of Earth rocks. Even in this case the age of the SNR GSH 138-01-94 changed from 4.3 million to 3.0 million years from 2001 to 2008. Probably because of more data and a change in the model. Just a back-of-the-envelope estimate: if the shock wave expanded at 10% c, which is nearly 6 times the 1.7% c average for the Cassiopeia-A SNR, then the cloud could have expanded to its current radius in 6000 years. Of course it would have been non-linear and slowed in the latter stages due to the much larger mass. These estimates are not unreasonable compared to the Cassiopeia-A SNR. Based on numerical modelling for masses up 60 solar masses ejecta speeds of 30,000 km/s dropping to 10,000 km/s are expected.3 So an estimate for a 200,000 solar mass SNR could conceivably have had a speed of 10% c (which is 30,000 km/s) averaged over the lifetime of the expansion. I would conclude therefore that a 1200-light-year structure (i.e. in diameter) is consistent with a supermassive star going supernova very shortly after its creation on Day 4 of Creation week about 6000 years ago. Are there any structures that are provably from a supernova and at least 10 times greater than this? That would mean they would need a process age of 60,000 years assuming an expansion rate of 10% c. But up to that can still be accommodated by the ASC model with very rapid processes during Creation Week when the expansion rate of the cloud was closer to the speed of light than at 10% c as required in GSH 138-01-94. Supermassive stars could go supernova very soon after their creation. Therefore the ASC model can accommodate significantly more process aging than an apparent 6,000 years but it would be limited to about 60,000 years for a structure about 6000 light-years in radius. That limit is set by the speed of light, c, which limits the speed of the expanding material. In reality the real process age is only 6000 years, only that the prior estimate assumed too low an expansion rate. Clearly for a structure bearing a neutron star at its centre, that is evidently a SNR, with a size much greater than 6000 light-year radius would be a problem for the ASC model. But where are they? The ASC model that I described in the above mentioned paper uses a timing convention to record when events occur. That is, events happen when one sees them happen. No delayed time due to a finite speed of light, c, is allowed for. All light initially from the cosmos must arrive at the Earth no sooner that the 4th day of Creation week about 6000 years ago. The stars and galaxies that emit the light that arrived at the Earth had to have been created at distances such that light travelling at the speed of light c arrived for the first time on Day 4 under the ESC. Under the ASC the instant the stars were created the light arrived at the Earth. There is no time lag. In 1987, only 28 years ago, the supernova labelled SN1987A occurred in the Large Magellanic Cloud. It was observed via the Hubble Space Telescope (HST) in Earth orbit. That explosion resulted in the SNR shown in Fig. 4. Here it is shown imaged between 1996 and 2003 at different wavelengths, optical, X-rays, and radio frequencies (left to right respectively). Over this period it is apparent the debris cloud has grown in size, and changed structure at different wavelengths. Though, it has not been imaged from its initial explosion in 1987. The star which exploded is at a distance d = 170,000 light-years. When did the star go supernova? Was it in 1987 or 1987 minus 170,000 years to allow for the 170,000-year-travel time of the light to reach Earth (assuming constant speed c)? The answer is both are correct. It depends on your timing or synchrony convention. Under the ASC events are recorded as happening when they are observed. So we would say in 1987 A.D. But under the ESC we would say about 168,000 B.C.. This situation I have tried to illustrate graphically (for those so inclined) in Fig. 5. Under ASC t0 = 1987 A.D.is the moment when the supernova happened, when it was observed (phenomenological language). We could also say for that to happen the inbound speed of light (one way) is infinite. Hence there is no time delay between the emission of the light and its reception on Earth. There is no light-travel-time problem. Now t1 = 1987 is the moment the event was first observed under the ESC after the light travelling at constant speed c for the time period d/c arrives at the Earth. Under ESC t0 = 168,000 B.C. which is the moment when the supernova occurred, which must be calculated from t1 – d/c. That assumes the two-way constant finite speed c for light. Yet, under the ASC we can also speak of phenomenological language. It knows nothing about the travel time of the light and only records the happening of the events when we observe them. Then years later in 2015 the SNR is observed at t0+Δt under the assumption of ASC. We can say the time that has elapsed is Δt, which for SN1987A Δt = 28 years. Only the time period Δt has elapsed and for the creationist model discussed here Δt must be less than ~6000 years. The distance to the source d does not matter; it has no bearing on the age of the structures.4 Under the ESC the SNR is observed at t2 = 2015, which still records the same period of elapsed time Δt, provided that the distance to the remnant has not changed. The difference t2 – t1 = Δt = 28 years, in this example. So let’s be really clear under ESC the initial observation was in 1987 but it is assumed the light travelled for 170,000 years after the initial explosion of the star. That light left the SNR 170,000 + 28 years ago. 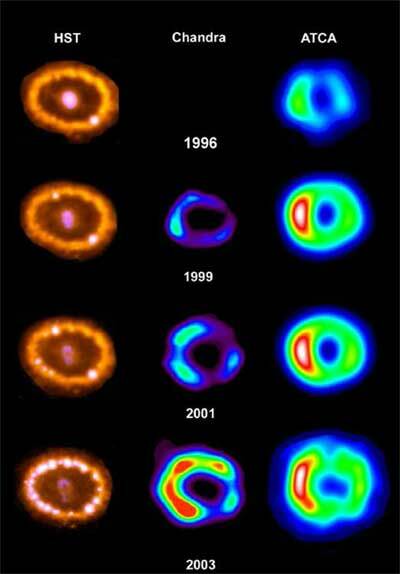 Then 28 years later we observed it again and the debris cloud (Fig. 4) has expanded to what we observe today. That light left the SNR 170,000 years ago. So for observations of the expanding debris cloud the travel time of the light to Earth (d/c) is not relevant. The only relevance d/c has is to the question of the origin of the universe. Is a date of 168,000 B.C. possible? In the ASC model all time stamping begins with the arrival of the light on Earth. For SN1987A that was in 1987 so the travel time is not a problem to the model per se. The days of Genesis can be time-stamped just the same way as the observation of the supernova here using the ASC. The 6-day Creation is preserved as 6 ordinary 24-hour days. No long periods are forced on the model. The meaning of Exodus 20:11 preserves also 6 ordinary days. The events of Creation are time-stamped from an Earth-observer perspective. Just like the example of SN1987A the notion of travelling for a long time prior to arriving at the Earth is not relevant. What is relevant is the growth of structure in the cosmos if such could be demonstrated to have taken more time than ~ 6000 years. So in this biblical creationist model no structure in the cosmos can have a real demonstrable age greater than about 6000 years. But to my knowledge there are no such structures. The ‘oldest’ SNR with an apparent age of 3 million years can easily fit within this requirement by assuming very reasonable expansion rates in the unobserved past. A. J. van Marle, N. Smith, S. P. Owocki and B. van Veelen, Numerical models of collisions between core-collapse supernovae and circumstellar shells, MNRAS. 407 (4): 2305-2327, 2010. In determining the size of these structures, because angular size is measured, their distance comes into calculating their size. From their size and measured expansion rate one may calculate the age of the SNR. But that has nothing to do with the time of flight of the light signal to get to Earth (d/c). The latter is a constant whether measured at the initial explosion t1 or later at t2.